At Shade Sails Canada, we work with a handful of the highest quality fabrics on the market, each with their own advantages and use cases. There are several important areas to look at when choosing fabric type, including but not limited to weight (measured in GSM: grams per square meter), UV rating, materials and construction and cost. Below you’ll find a listing of the main fabrics we use at Shade Sails Canada. If you have any questions at all, please don’t hesitate to contact us. 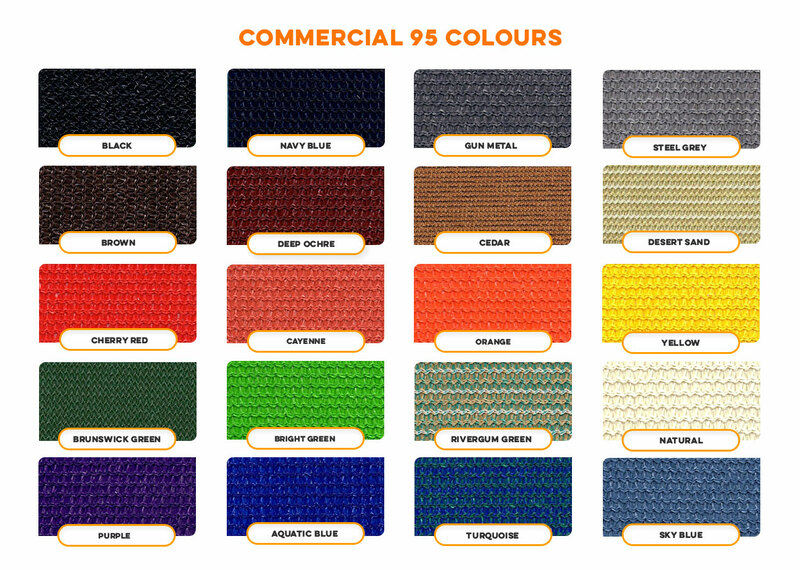 Commercial95 comes standard with all of our premium shade sails. Developed by one of the largest and longest running shade fabric companies in the world out of Australia, the home of tensile fabric architecture, Commercial95 strikes the perfect balance between weight, construction and UV protection. 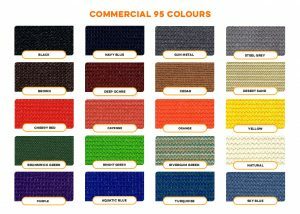 Available in 20 colours, we recommend this fabric for most residential and small-scale commercial applications. This fabric has a specialized-lock stitch knit for more air movement with a stretch of approximately 4%. It’s fade & tear resistant qualities mean your sail will not crack, rot or fray and it comes with a 10-year manufacturer’s warranty against UV degradation as well as being 100% recyclable. We use Monotec370 shade fabric on most of our large-scale commercial projects, however, it can also be used in a residential setting for those wanting the highest quality fabric. 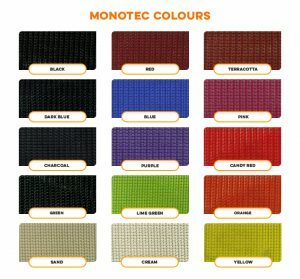 Heavier in weight than Commercial95 and DryZ, Monotec also comes in vibrant colours you won’t find in our other ranges. Its main selling point is its construction; It’s the only shade cloth manufactured using 100% round monofilament HDPE yarn with no tape or filer. A major advantage to the strength the round monofilament yarn provides is its vandal resistant quality; combined with the close lock-stitch construction makes it difficult to penetrate the fabric with damaging objects. A stretch of approximately 2% means your sail will not stretch over time, assuring the integrity of your structure’s stability for many years. Monotec has superior durability and performance, especially in excessively high wind conditions and comes with a 15-year manufacturer’s warranty against UV degradation. 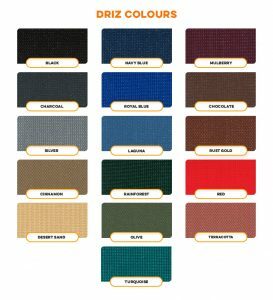 DriZ is a premium waterproof shade cloth of regular fabric (a mixture of monofilament and tape) finished with a waterproof coating, extending the usage of a DriZ sail into the shoulder seasons. DriZ provides up to 100% UV protection but allows natural light transmission and comes in a little lighter than our other fabrics at 280 gsm. DriZ has excellent tear and fray resistance, comes with a 5-year manufacturer’s warranty against UV degradation and is 100% recyclable. Proudly manufactured in South Africa, this is the perfect fabric if you’re looking for an all-weather shade sail. 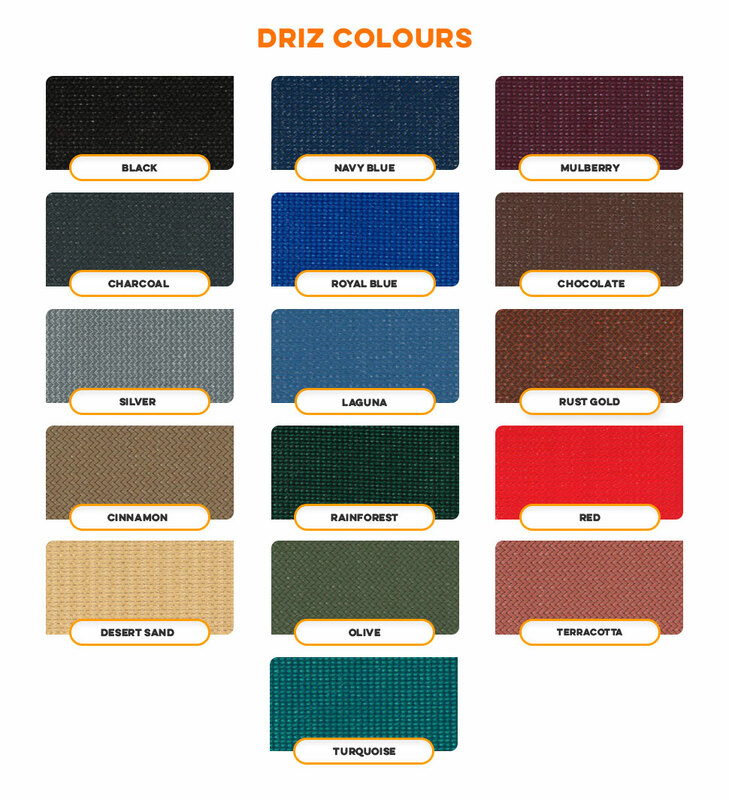 Presently we stock the following colours in Dri-Z; Turquoise, Charcoal, Desert Sand, Royal Blue. Colours that we do not stock will require a special order which will incur extra time and cost, please contact us for special order information.